I can remember clear as yesterday the day that Risa and I sat with Babci in her room at Rosary Hill Home in some of her final days, and she started speaking of these new, strange towns to us. Skarzyce, Winnica, Pultusk, Nasielsk…. they seemed to come out of thin air and had nothing to do with the town we had always been told she was born and grew up in, Przemyśl. A map was drawn on a worn piece of paper showing the location of the towns….Skarzyce just to the west of Winnica, with their nearest major city of Pultusk in the distance. Coming home soon thereafter, long before I embarked on my Polish citizenship quest, I googled the towns and was surprised to see them all 40 or so short miles from Warsaw…. How did this relate to my Babci’s life? Did she simply remember some distant family from these places who were her closest relatives during the time she was in Warsaw alone during the war? As we relaxed in Montenegro, spending our days swimming in the bay of Kotor, I began firing off a series of emails & embarking on some research with various genealogists in Poland so that we might make our “fact finding” trip that much more interesting & valuable. Proposals soon trickled in…. 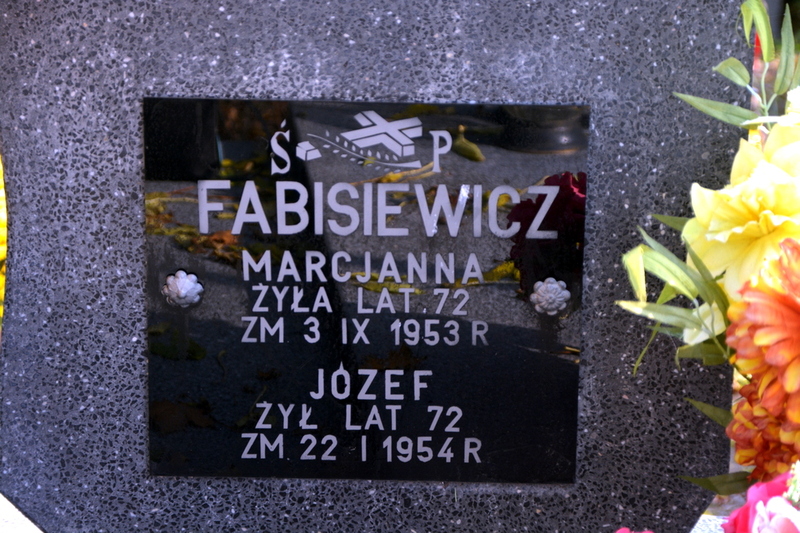 $150 to obtain information on one generation back of relatives….$175 to obtain all research on Fabisiewicz’s in Przemysl. I decided to move forward with the one that seemed the most potentially fruitful, expecting at best some direction on where we should target our search when my parents arrived and we were all in Poland. Several weeks later, an email arrived containing names I’d seen before. 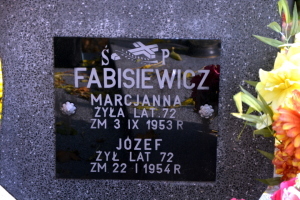 Babci’s original parents names – Jozef & Marcjanna. Since then we’d seen a new set of parents names mentioned on a wedding certificate and had almost discredited these as non-factual. As I read however, the plot thickened. 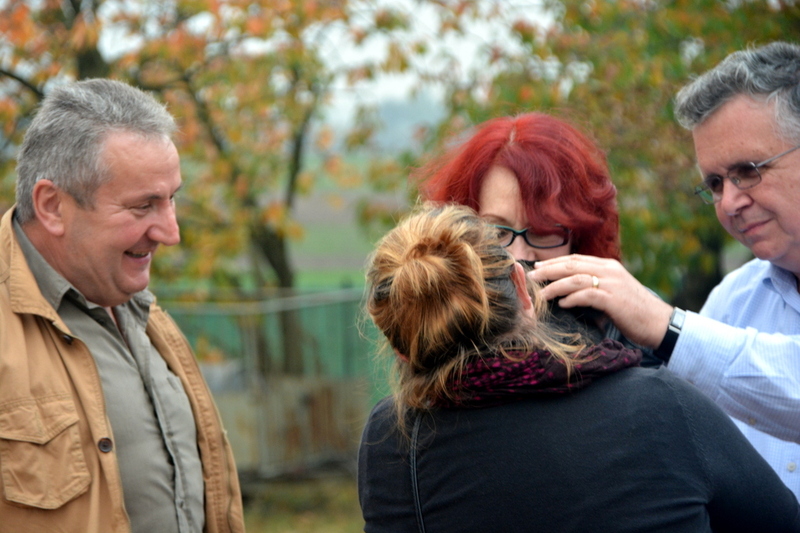 Jozef & Marcjanna were married in the village next door to Winnica & had been born in Skarzyce. Suddenly I felt we were hot on the trail…. Flash forward to Monday, October 13th. My parents arrived over the weekend in Warsaw and this morning we met with a genealogist at a local cafe in Warsaw to get tips on where to get started on our search before heading out in the car to the towns we’d heard about. Leaving the cafe it felt bleak… we had a drawing of what their names should look like in Russian Cyrillic, as we might need this since this was the language of records in Poland before 1918. After listening to advice from our consulting genealogist, we decided first to head to the USC (office of civil records) in Winnica instead of those in Gzy or Pultusk — a seemingly random decision; it was first on the way. Walking into the office of the Secretary of the Gmina in Winnica, we explained our story. We longed for any information on any Fabisiewicz living in the area, hoping to perhaps find the birth records of some brothers or sisters or those of my Babci. The search started with few successes…. a thorough search of the 1924 book (the year my Babci was born) revealed no records at all with her surname. The secretary didn’t seem interested in looking in too many books, so we carefully suggested to look in 1925. No luck. 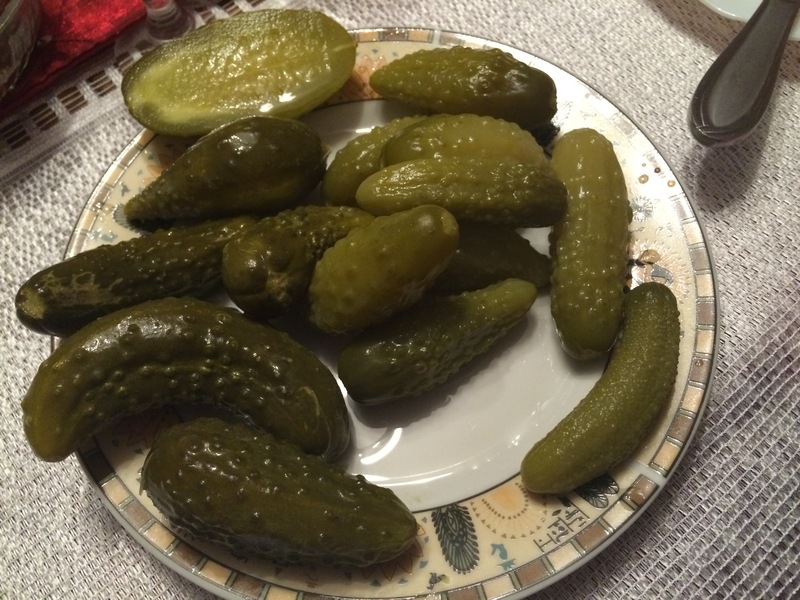 My mother’s perfect fluent Polish then convinced her to look further in her computer to see if there could be any hits….even a distant Fabisiewicz relative. All of a sudden the name Henryk… and then Czeslaw. These were names we heard OFTEN. My Babci’s brothers. But we were in Winnica – perhaps 600 miles from Przemysl. Why were we finding a record of these people here? 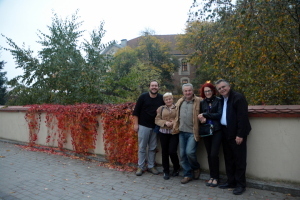 Moments later it was confirmed – Henryk and Czelsaw were born to Jozef & Marcjanna…the same parents I’d learned about in the research from several days back. What about Babci though? Perhaps all these “brothers” were just cousins or some distant relatives and we were on a false, confusing trail. While I was excited, I began to feel like this was as I expected it to be – an even more confusing experience that would only open more questions. All of a sudden, after Risa suggested we might check the 1923 book, the secretary uttered the name, Michalina. We had located my grandmothers birth record. She wasn’t born on 9 May 1924, instead she was born over 1 year early on 19 March 1923. I can’t explain to you the feeling at that moment. A heady mix of excitement, complete confusion & sadness. What had happened that forced Babci to tell all of us that she was born 600 miles away from this place and never speak of her family until her dying days? What transpired next makes me feel that sometimes…just sometimes, what happens in movies and TV isn’t that far from reality. 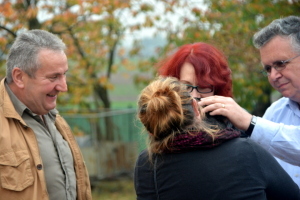 Years ago we watched an episode of “Who Do You Think You Are” with Lisa Kudrow looking for her family in Poland, and I laughed and ridiculed how she magically found her family during the search & actually met some living relatives. THESE THINGS JUST DON’T HAPPEN. At that moment… the secretary picked up the phone and made a call…. as she spoke only in Polish I didn’t know exactly what was happening, although my Mom tried to keep us filled in somewhat. 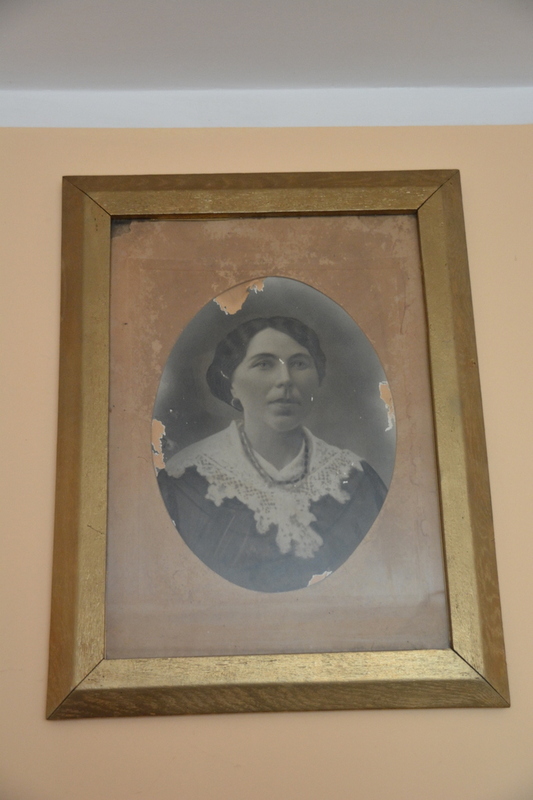 A relative, a direct descendant of her brother Henryk lived less than 2 KM away, and she would call their house for us. We all sat in stunned silence. Speaking only for myself, I couldn’t even react at this point other than with stupefied excitement. We were told that a relative was now on a bicycle riding towards the secretary’s office and she would soon meet us. 20 long moments of waiting later and the woman I know now as the wife of my Mother’s first cousin arrived, looking just as nervous and as excited as we were. We didn’t really know what was happening next as my Mother began to speak to her and they embraced. 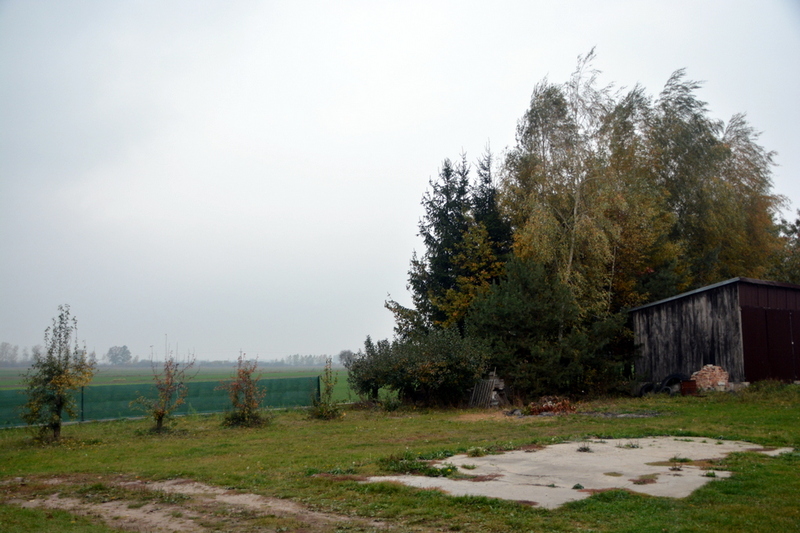 Next we learned that Elzbieta would take us to the cemetery so we could see the graves of Henryk & Czeslaw. This was all happening so fast… On the way we learned that Babci’s brothers died as recently as 10 years ago. They had lived their entire life in Poland while my Babci was alive in America. No one died tragically during the war…. Arriving at the cemetery Elzbieta first took us to another grave, the grave of Marcjanna & Jozef Fabisiewicz, my Babci’s parents. I’ve never been an emotional person in cemeteries to be honest, but for some reason seeing their grave tears began to well up in my eyes. We always heard from my Babci how her mother was sick during childbirth so we had assumed she didn’t live much after her birth. Instead we soon learned they passed away in their 70’s in the early 1950’s. I couldn’t really speak a coherent sentence so I just listened and uttered words like “wow” and the like as my mother & Elzbieta caught up on 70 lost years. This was a moment bigger than any of us. What happened for the next two days really is the stuff of movies. Those of you all who have known me for some time know that on my Mother’s side of the family I’ve often told you how I have no living relatives after my Babci died. Well, last Monday and Tuesday we ate, drank & watched a Polish football game with my Mom’s first cousin Marek and his family. We saw the land she grew up on, a stones throw away. We stood in Marek’s & Elzbieta’s living room and saw a painting of my Babci’s mother. We drank “bimber,” were fed enough Polish cuisine to catch up for those 70 lost years, and I did shots of Whiskey with them while watching Poland come to a draw with Scotland in a Euro 2016 qualifying match. I’m not certain I’ve still processed what happened last week. I came into it hoping to find some clues for my Mom and I to know about my Babci’s life…perhaps at least some closure on what happened to her family. Never in my wildest dreams did I expect to come away from this with an entirely new side to our family tree. 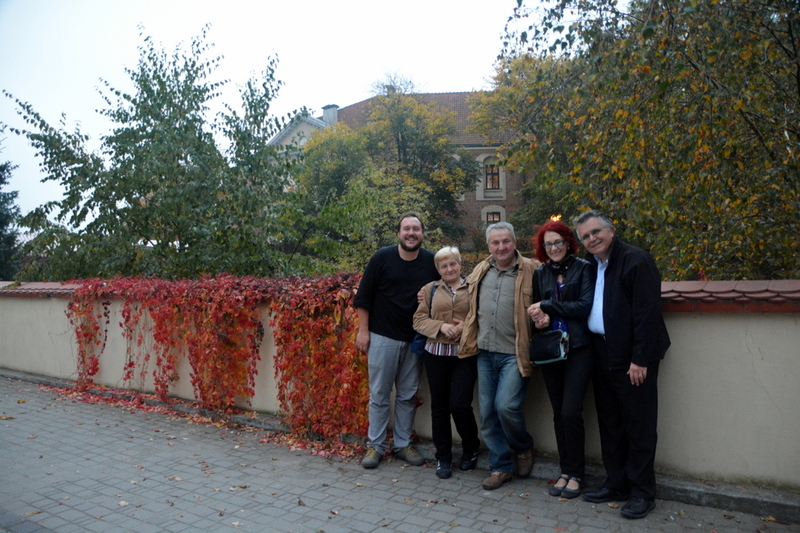 Not only did Marek & Elzbieta’s family meet us, the welcomed us unlike anything I could put into words. Marek & my Mom held hands nearly the entire time. The whole experience was as though we’d known each other for years and were simply catching up. Babci – we will never know exactly why you told the world that you were born in Przemysl on May 9, 1924. All that I know for certain is that it was no accident that you told us about Winnica, Skarzyce & Pultusk on that day in Rosary Hill. You may have kept this a secret for 80+ years of your life, but, as your time on earth drew to a close you wanted to give us a hint at where you came from. I can only hope that you were there with us in Skarzyce when your daughter held hands with your brothers son – barely 1KM from the land you were raised on. You may have done this all to protect your family from the backlash of being a part of the Armija Krajowa — we will never know. All that I know for sure is that we left Poland today with a loving new side of the family – The Fabisiewicz’s. In two days they welcomed us more than some families welcome their members in a lifetime. I truly have no words to convey how we were made to feel welcome in their home – it was amazing. Sometimes life truly is stranger than fiction. I entitled this post “a very rigid search” as an homage to “Everything is Illuminated” – a movie that I see as a perfect mix of the comedy, emotion & passion associated with finding ones roots. I never expected to leave Poland being able to say this about the Fabisiewicz family, but finally… Everything Is Illuminated. This entry was posted in Poland, The Journey and tagged Skarzyce, Winnica. Bookmark the permalink. Wow, what an amazing story! To learn after all that time that you have actual living relatives and to get to meet them… incredible! Truly bizarre and amazing when i step back and look at it all. Also, a part I left out of the story is that i nearly found the family via Facebook before even going, was just 1 step away! Fantastic post! 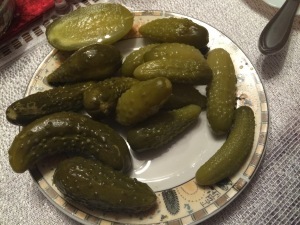 My relatives on my mom’s side hail from the Tarnow region of Poland. On my mom’s behalf, I hired a genealogist to show me around the area and visit church deacons in small villages to view the records when I visited Krakow in 2000. Anyway, twas a great read. I’m glad your trip continues to reward! I had no idea you are a Pole also. Sounds like you made some decent progress already, but this is the company that I used to get me background research (birth, marriage & death certificates) that ultimately linked my Grandmother with her family. I would highly recommend them for the professional and comprehensive service they provided for what was a reasonable cost considering. 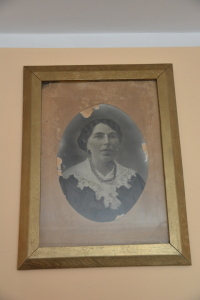 Hey Alex–any chance you could share your Polish genealogist contact info with me? I’m trying to prove German citizenship through descent and they were from an area that is now Polan! Sure, happy to help in any way that I can. I actually never ended up paying a genealogist directly as the initial searches that I had with some were fruitless. 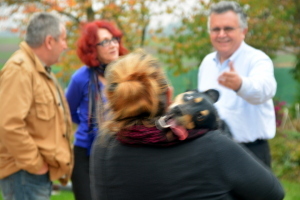 That said, Zenon ended up being enormously helpful in meeting us in Warsaw the day we started our search and helping to direct us to the right office in a small town to get started at. He was also super friendly! I used a lawyer in Krakow who helped me with some other local document searches, but she was the same lawyer who filed my citizenship application. I think she specializes only really in getting Polish citizenship restored but let me know if you want her contact info also.